In a previous review, I explained how I, with a lot of help, made a small wooden phone stand. I thought of the idea of a phone stand because I thought it would be fun to do some woodwork, but be able to do it very simply. Before that, I always thought it would be really cool to make a wooden computer case. There are plenty of challenges to consider when making one; first is what it would look like. My first thought would be to make a computer that would also be a monitor stand, sort of like many of the older PCs. I have to move my computer around a lot, and the smaller size would be appreciated. The other thought I had would be for the top panel to be see through and be connected by hinges on the one side. So, if you need to make any changes to the internals, it is as easy as lifting a lid. There are other challenges as well. Wood insulate heat and having good airflow is crucial to ensuring the temperatures stay in line. By far though, one of the main reasons I want to do it is to have a smaller case, but still have an ATX motherboard. I do not want to spend more money on a small case and then a smaller motherboard as well. Smaller sizes are sometimes quite nice, especially when you really need it. I have always used a tenkeyless keyboard because of its smaller size it uses up less space on my desk. Usually, when you do get something smaller, you have to sacrifice some features. But today, we have the Cooler Master CK530, which boasts all the same features as its bigger brother, the Cooler Master CK550, just without the numpad. Is it as good as it sounds? Read on to find out! We received quite a few Cooler Master products that will be up for review in the coming weeks. The Cooler Master CK530 was among them, while the Cooler Master MM830 was reviewed last week. The package was shipped via FedEx Ground and arrived in fairly good condition to us here in Calgary, Alberta. It was a really large box, but as you can see only the one corner was pretty beat up. The rest of the box fared much better. There were only small dents around, while the edges took some more damage than the rest of the box. None of this is unusual and so there was no reason to be alarmed. Cooler Master took the required steps to ensure everything arrived safely. After inspecting the outside, I proceeded to have a look at everything that arrived. The Cooler Master CK530 is the little brother of the Cooler Master CK550, which was reviewed a while ago. Their retail boxes are identical. An image of the keyboard is front and center, with the name in white lettering in the bottom left. To get a better feel for the Gateron Blue switches, the arrow keys are available to play around with. I am always paranoid about how many people have played with the keys. Like, what if they are actually broken from all the people who tested it? I know it is not generally the case, but the thought always pops into my mind. Anyway, the black background and purple color scheme looks great, and the RGB LEDs are effectively demonstrated on the large image on the front and with the multi-colored badge. The rest of the retail box is standard with some extra information located on the back and in many different languages. The contents of the Cooler Master CK530 are fairly basic. After removing the top flap, I was met with the keyboard covered in a plastic bag. The cable is stored along the top behind some cardboard, and after lifting the keyboard up out of the box, I was met with the small manual and a keycap puller. Finding and downloading the required software is an easy task thanks to the manual. A keycap puller is always a welcome addition as it makes getting some of the keycaps off way easier. The absence of a wrist rest here is not surprising, since the keyboard is in a much lower price range. The packaging is simple, but not much more is required anyway. Since the Cooler Master CK530 is the little brother of the CK550, the design is almost identical. There are no dedicated LEDs to indicate if Caps Lock is on and so forth, but the great aluminum backplate is still present. An aluminum backplate is always appreciated because it looks great, but also provides some excellent build quality. At either end of the CK530, the aluminum slopes down and outward slightly. It makes the keyboard a bit bigger, but not by much. The keys are also slightly raised from the backplate, which creates a cool effect and means the RGB LEDs reflect off of the backplate. The light can easily escape and creates an overall really great look. The keycaps are laser-etched ABS, which are of average quality. They do attract oily marks, but it is easy enough to clean. 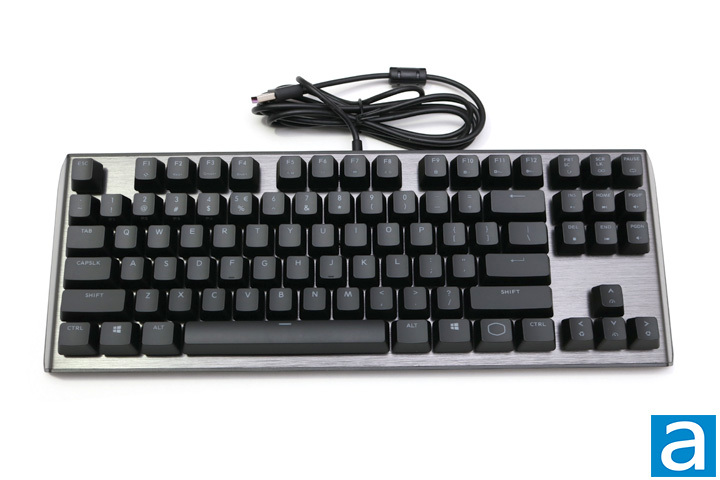 The CK530 features the same grey aluminum and the only indication that it is a Cooler Master keyboard, is the minimalist Cooler Master logo located on the right side of the keyboard. 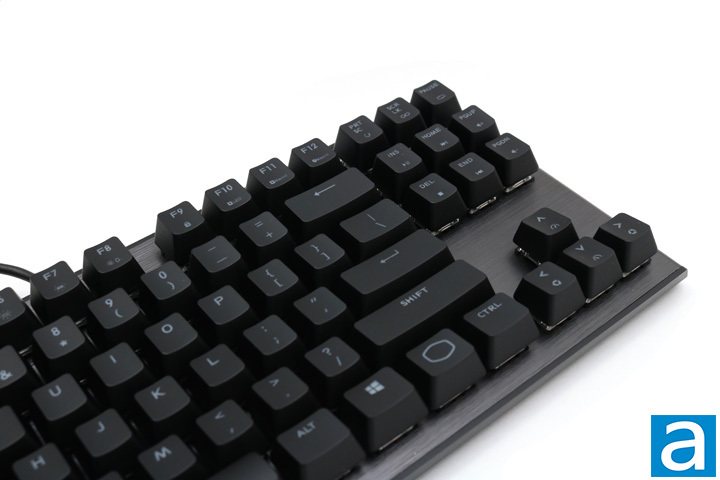 This logo takes the place of the Function key, and allows one to control the many secondary functions of the keys. Lastly, the keyboard has a standard 104-key QWERTY ANSI layout, with no changes made to the spacing either. 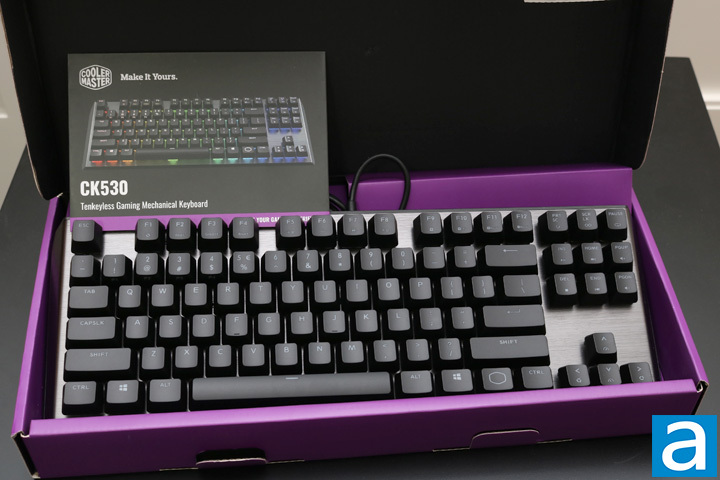 The aim of the Cooler Master CK530 is to provide an excellent keyboard in a smaller package. A tenkeyless design is perfect for this. The dimensions of the CK530 come in at 380 mm in length, by 135 mm in depth, by 40 mm in height. The dimensions are nice and compact, but it does sacrifice the numpad, which I know for some people is a big sacrifice. I found the keyboard to be nice and small, especially since my daily driver is a tenkeyless keyboard. I have never really used a numpad, and I would only use a numpad if it was located on the left side of the keyboard instead of the right -- if such a keyboard exists. The compact size translates into the weight as well, which comes in at 749 g. Generally, full sized mechanical keyboards come in around 1 kg, so the lighter weight is a nice change. One of the great advantages of the Cooler Master CK530 is all of the secondary functions that can be accessed without the software. 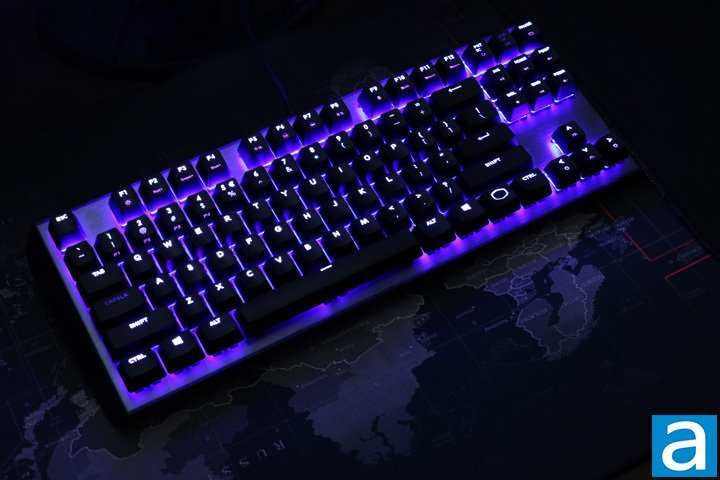 The RGB LEDs can be adjusted through using the F-row keys, just like with the CK550. 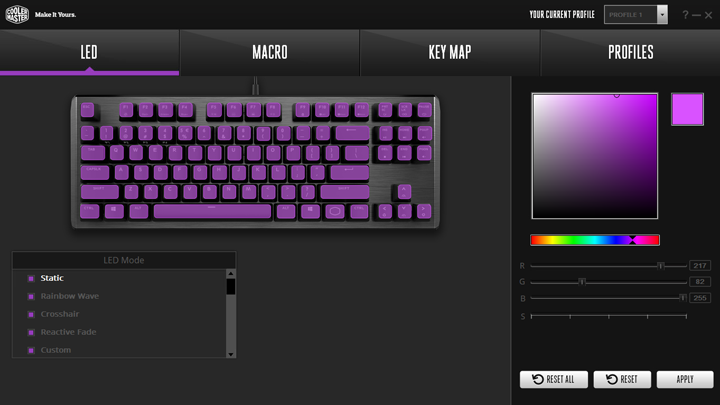 F1 cycles through different colors and modes sort of as a quick demonstration or quick look at what the keyboard has. F2, F3, and F4 adjust the color settings, namely red, green, and blue, respectively. Pressing one of these keys, changes the color slowly until it fully becomes either, red, green, or blue. So, if you know your color combinations well, you could achieve many different colors through only using these few keys. In the above picture right under the numbered keys from 1 to 4, you can see a P1 to P4 listed. These are used to program specific colors or color modes to specific profiles. From F5 to F8, are some more RGB LED functions. F5 cycles through LED modes, F6 and F7 adjusts the foreground and background effect of the different modes, while F8 starts the demo mode which just shows off all the different LEDs and their colors. This mode actually prevents any key presses. Moving on to this side of the keyboard, there are some more functions. F9 allows one to lock the Windows key, if pressed again it locks the whole keyboard, and then if pressed again it will unlock the keyboard. F10 to F12 is used to create macros, as well as Print Screen, Scroll Lock, and Pause buttons are used to determine the different types of loops for the macros. The grouping of six keys above the arrow keys are all the media controls, which is wildly different from other keyboards I have used in the past. It took some getting used to, but being able to change volume with one hand is an advantage. The arrow keys control the speed of the lighting effects or change the direction of the lighting modes. All in all, there is plenty of functionality without the need for software. Cooler Master has ensured the CK530 has NKRO, which is N-key rollover. This means that no matter how many keys are pressed independently, each individual key will be recognized. 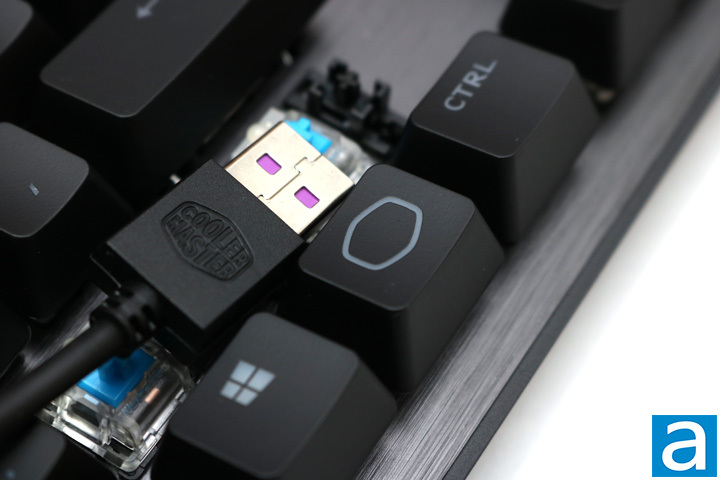 NKRO is a must for gaming keyboards, as there are plenty of occasions where you need to press multiple keys and having each key registered is crucial. The CK530 also allows one to switch between NKRO and 6KRO, which just limits the amount of registered simultaneous key presses to six keys. 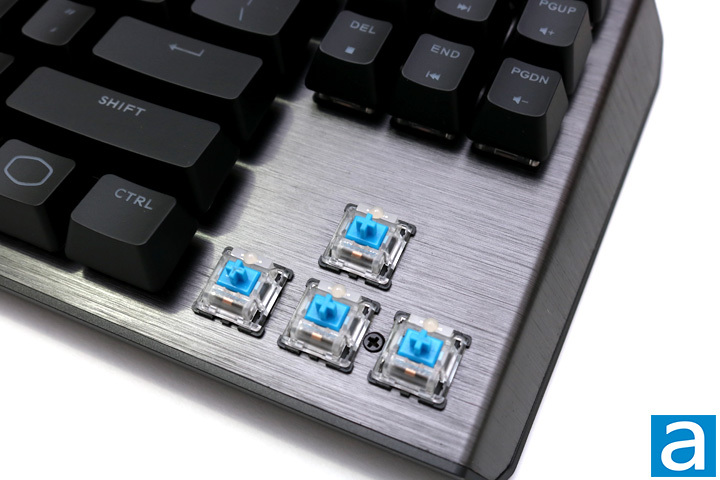 Furthermore, the Cooler Master CK530 has mechanical switches, particularly Gateron Blue switches. Mechanical switches are one of the main types of switches selling today, the other two being membrane or scissor switches. Originally, Cherry MX had the mechanical switch market cornered, but there are more and more manufacturers such as Kailh or, in this case, Gateron. The Gateron Blues imitate the Cherry MX Blues, and do a good job. I will more precisely detail their feel later in the review. They have a 60 g actuation force, which is quite a bit higher than the Red linear switch on the CK550 I have reviewed. They are clicky and tactile, meaning they are really loud. The CK530 is also available in Red or Brown switches. The back of the Cooler Master CK530 is fairly straightforward. At the top right and left are two little feet that can be extended to angle the keyboard down a bit. These feet are covered in rubber to grip whichever surface they are on. 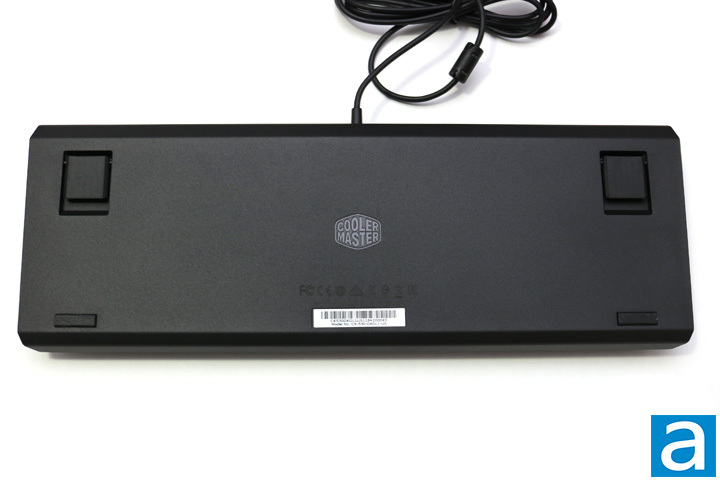 At the bottom left and right, are two small rectangular rubber feet to keep the keyboard in place on any surface. Out of the top of the case, we find a 1.8m rubber cable, which is a good length for a keyboard. Inside of the keyboard, we find a 32-bit ARM Cortex M3 processor as well as 512KB on board memory. It boasts impressive specifications to store the necessary profiles and other settings you may save onto the CK530. The Cooler Master software for the CK530 works the same as the software of other Cooler Master products. First, one needs to download Portal, which functions as the base for all the other pieces of software. From here, one downloads specific software to a specific accessories. It is a nice and simple process. The software itself is very intuitive. The first tab allows one to choose between a myriad of lighting effects or customize each individual key to their own liking. The Macro tab is used to create and assign macros. This makes using macros a little less clunky than programming them only using the Fn and F keys. The Key Map tab allows you to make changes to all the keys on the keyboard, while the Profiles tab allows one to change profiles or restore them to default. All in all, the software works and is intuitive. One of the best things of the brushed aluminum backplate is how the LEDs reflect off the bottom. I always enjoy the overall look from it. This is also because the floating keycaps create a nice space for the light to escape. I appreciate the look of the CK530 just as I appreciated the overall look of the CK550. When it comes to the actual feel of the keys, I found the CK530 to do a great job. It was quite an adjustment for me to get used to the heavier actuation force, because I am quite used to Cherry MX Red switches. The feel of the Gateron Blue switches were very good. They were clicky and responsive. They were not squishy at all, ensuring the crisp feeling throughout the entirety of the time I used them. The tactile feedback felt good, and all of the keys were consistent. The CK530 provides excellent feedback, and I am sure anyone who is looking for a Blue switch would find this keyboard satisfying. Sometimes smaller packages provide a nice alternative to what is much bigger. A tenkeyless keyboard is a nice space saver, especially to someone with limited desk space. There are even more compact keyboards out there, but they start to change the size of the keys, which is undesirable. The CK530 is truly an excellent space saver. Being almost identical to the CK550, the CK530 carries over the same strengths but in a smaller package. The only sacrifice is the numpad, which if you do not use it then it is not much of a sacrifice anyway. Starting with the build quality, the CK530's brushed aluminum backplate provides reasonable rigidity to the keyboard as well as looking great. The keycaps themselves might not be made from the highest quality plastic, but they still hold up well enough. They attract oily marks, but it is not too hard to clean. Otherwise, the Gateron mechanical switches have an excellent rating at 50 million key presses, and have a nice crisp and responsive feel. I could not detect any squishiness in the keys at all. Extensive customization can be accomplished without using the software, which is good, but the software is easy to install and intuitive to use. It allows one to make extensive changes and access the full range of RGB colors. 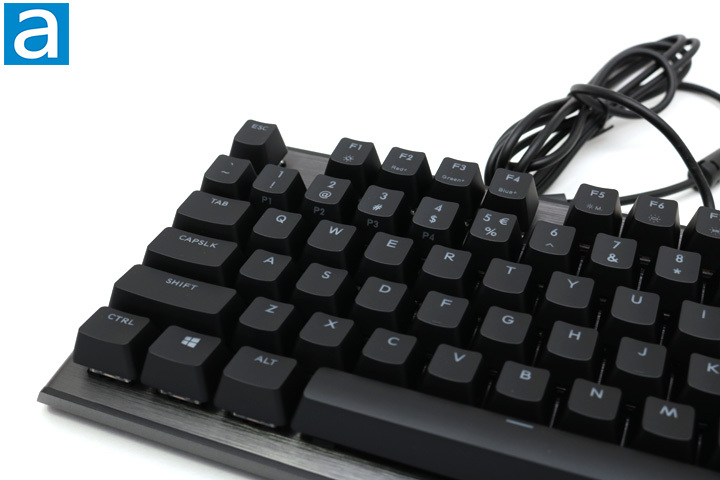 The CK530 is a solid keyboard and great smaller alternative to the larger CK550. It is also quite a bit cheaper, having an MSRP of $70 USD. 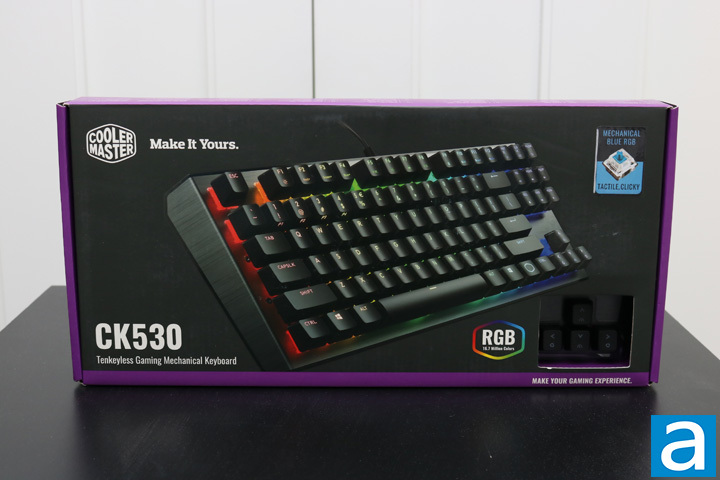 If you are looking for a smaller keyboard with the same RGB features, the Cooler Master CK530 is definitely a good option to consider. The Cooler Master CK530 promises excellent quality and full RGB in a smaller package compared to the CK550. Do you have any comments or questions about the Cooler Master CK530? Drop by our Forums. Registration is free, and it only takes a minute!